William Kelly Warren embodies the spirit of the independent oilmen who developed Tulsa from a sleepy cowtown into the Oil Capital of the World. As well as becoming a successful oil executive and an outstanding leader in all areas of the petroleum industry, Warren also carried roles in banking, medical research and education. He established a hospital and was a Roman Catholic lay leader, humanitarian and philanthropist. Warren was born in Nashville, Tennessee, on December 3, 1897. Throughout his childhood and adolescence, he struggled with poverty and constantly searched for ways to earn a buck. Warren worked in various occupations as a newspaper carrier, a Western Union messenger, a peanut vendor in a baseball park, a drug store employee, a door-to-door salesman and even a dance hall instructor. When he was 18 years old, Warren decided to leave his home town. With his job as a railroad filing clerk, he earned a mere 40 dollars a month, and he had heard of the lucrative job opportunities in Oklahoma. Warren arrived in Oklahoma in 1916, and by this time, Tulsa was well on its way to becoming the Oil Capital of the World. He soon became an accountant with Gypsy Oil Company. Later, he worked for Gilliland Oil Company and McMann Oil Company. Warren married Natalie Overall on September 21, 1921, and the couple had seven children. In March of 1922, the Warrens scraped together 300 dollars and organized a firm to purchase the output of gasoline plants handling natural gasoline and liquid petroleum gasses. The company began in two rooms of the Atco Building and had two employees—Warren and his wife. With Warren’s ingenuity in the processing and marketing of liquidized petroleum gas, this tiny company emerged as the world’s largest independent distributor of the product many years later. Warren generously contributed to many projects within the Tulsa community. The William K. Warren Foundation was chartered in 1948 for the purpose of donating to hospitals, churches, schools and worthwhile charities. Warren established Saint Francis Hospital in 1960. 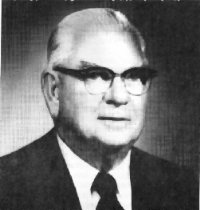 Warren served as Chairman of the Board and Chief Executive Officer of Warren Petroleum Company from 1922 until retirement in 1961. He was a strong leader with an abundance of administrative ability.